On the CST Stage: CST still has LSU tape delay broadcast rights for now. This image is from the taping of the opening segment for the LSU - Georgia Game on October 3, 2009. Cox Sports Television (CST), which is in Athens, Georgia for a tape-delay broadcast of today's game between 4th-ranked LSU and 14th-ranked Georgia, has recently entered into a multiyear agreement with ESPN Regional Television for the rights to Southeastern Conference content. Here is the news release that was issued by CST. Cox Sports Television (CST), one of the fastest-growing regional sports networks in the South and the exclusive regional sports network home of the LSU Tigers and Arkansas Razorbacks, has reached a multiyear agreement with ESPN Regional Television for the rights to Southeastern Conference (SEC) content beginning this fall. Opening with the 2009-10 season, CST will air a minimum of 92 SEC events, including a minimum of six football games, 20 men’s basketball games, 16 women’s basketball games and 50 Olympic sports events (baseball, softball, volleyball, women’s soccer, gymnastics). CST has enjoyed a long-term relationships with LSU and Arkansas dating back to 2002 and 2004, respectively. These SEC events will be televised across the entire CST network and will be available to selected Cox Communications markets across the country. Included in the CST coverage area are several SEC school homes, including LSU (Baton Rouge, La), University of Arkansas (Fayetteville, Ark) and the University of Florida (Gainesville, Fla). “The LSU and Cox partnership has been terrific for many years and I am pleased to see the exciting national exposure generated through the new SEC-ESPN agreement now take shape with an equally strong regional package with CST,” stated LSU AD Joe Alleva. “The SEC agreement with ESPN coupled with the new regional agreement with CST will provide additional exposure for our teams and student-athletes. Our partnership with CST has been beneficial for our program and will continue to play an important role in providing even more Razorback events to our fans throughout the state and the region,” commented Arkansas AD, Jeff Long. CST will carry live football this Saturday from Oxford, Mississippi. The 5th-ranked Ole Miss Rebels host Southeastern Louisiana at 6:30pm. 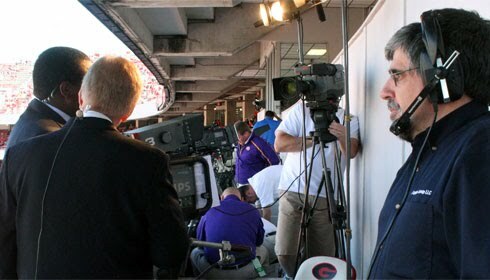 In 2002, CST became the exclusive regional sports network home for LSU by providing up to 37 Tiger events per year. Since then, the number of events has grown to more than 50, including full game football replays on Sunday and Wednesday nights during the season. Over the past three years, CST has also partnered with the University of Arkansas. CST produces 16 live Razorback events including basketball, baseball, gymnastics, track and the annual Red-White Spring football game.